When we were thinking about building a garage for our new van, I wanted to go with a steel arch design because a dear friend has had one on his property for many years, and is well pleased with it. I decided to go with the same company where my friend got his kit – Steelmaster USA. They make many different varieties which all have their strengths and weaknesses. My friend has an “A” type arch, which looks much like a traditional gable roof. For our garage, we chose an “S” type arch which allowed us to have the height we needed for our van without making the arches wider than necessary. Our arches are a semicircle resting on long straight corrugated wall pieces. I sized the building to fit the van, and asked for a quote for the kit. As it happened, an S-type building slightly higher than we needed was available on clearance. At this point, I made my first mistake. I ordered the building with the standard foundation. As you can see from this photo, the standard foundation plan calls for notches to be cast along the perimeter with concrete j-bolt anchors embedded into the concrete at the time of the pour. I remembered my friend saying how critical the positioning of the j-bolts would be, and complaining that his concrete contractor had misplaced some of his. I was ready for this. 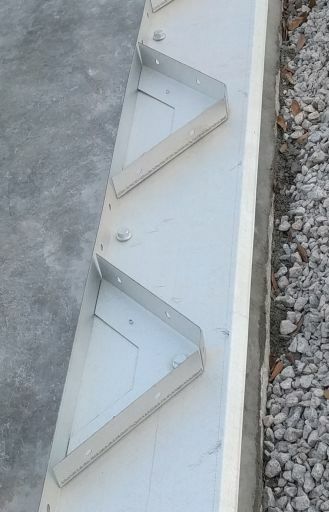 I planed to make templates out of 1 x 6 lumber with holes drilled at the correct positions which the j-bolts could hang in until the concrete began to harden. I ordered the building and received the plans right away so I could obtain the needed building permit. While I was waiting for the kit to arrive, I began studying the plans. 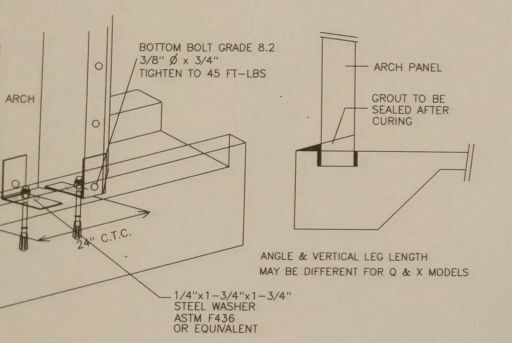 The first thing I noticed was that they called for expanding concrete anchors rather than wet-inserted j-bolts. They also called for attaching the building to the bolts using angle brackets, and after building completion, the foundation notches were to be grouted in, permanently anchoring the building to the foundation. That meant that the building could never be relocated, but that didn’t really concern me. In talking with some other folks about the building, one of them mentioned that he had seen some of these grouted-in buildings rust out at the bottom due to the corrosive nature of the grout. My friend in Florida has had his building for many years without any problems. They have pre-drilled holes for the anchor bolts, so there’s no guesswork or meticulous measurement needed to place the anchors. They have built-in pre-drilled attachment brackets for fastening the bases of the arches to the foundation. The IBC foundation spec does not call for cast-in notches, making the pour cheaper and faster. The IBCs do not need to be grouted in, so if necessary, the building can be re-located. 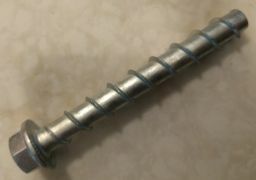 Instead of expanding anchors or j-bolts, the IBC specs call for screw in anchors which can be easily removed. When I returned from visiting my friend, I called up Steelmaster and ordered the IBCs along with new plans. After receiving the plans, I went ahead and set up the foundation pour with a local concrete contractor. What I didn’t realize at the time, was that having ordered the building with a standard foundation, and later switching over to IBCs, I was introducing a new set of problems due to the fact that the IBC foundation without cast-in notches would raise the entire building up by about 3.5 inches. This doesn’t sound like a big problem, but as it turned out, it ended up costing a great deal of time and money that might have been saved if I had ordered the building with IBCs in the first place.